The anti-paracy coalitions MPA (Motion Picture Association) & ACE (Alliance for Creativity and Entertainment) hand-delivered several DMCA notices over this past week. Assessing the extent of the damage to the Kodi third-party community will remain difficult for some time. We will keep you apprised of current events as we hear them coming through our network. Among those shutting their doors for good is the wildly popular Ares Project. With the recent change to their Ares Wizard, they became a prime target of the anti-piracy coalition. The Ares Wizard had made it possible for Kodi users to simply browse their Ares Portal web site and throw third party TV Addons into a shopping cart. Upon check-out, they would get a 6 digit PIN to input into their new Kodi Portal add-on. Then, the Kodi Portal add-on would install all of the TV Addons that had been in the shopping cart. This seems to have been the last straw for the MPA & ACE. It was becoming far too easy for the average Kodi user to access pirated entertainment. Amidst the turmoil and fear, the Colossus repository closed up shop as well. This closing of the Colossus repo includes the favored TV addons Covenant, Bennu, and FearOfTheDark. The GitHub account for the Colossus repository was entirely cleaned out by its developer in an attempt to pull themselves from hot water. Many others have also closed themselves down, such as Smash repo, Mucky Duck repo, Dandy Media repo, Boom! repo. It’s unknown which repos have gone for good and which will be back again. Perhaps some will take the TV Addons route and come back in a more above-board, “official” capacity. Only time will tell at this point. The TV Addons making their homes within the taken down repositories should continue to work for now. This should last until the lack of updates causes them to fail at their attempts to acquire any more streams. Highly advised: turn off automatic updates until things clear up. Some TV Addons may become compromised by the anti-piracy coalitions. We’ve seen this happen before with the exceptionally popular Exodus TV addon. Exodus went down due to its home TV Addons repository ending up in court. Many versions of Exodus then appeared out of nowhere. Some of these only existed to gather information about Exodus users. It will likely happen again with this week’s outages. If you’d like to avoid any possible nastiness from spyware and malware, then avoid the Kodi TV addons automatic updates feature. These updates can leave you open to spyware and other forms of malware when repositories get compromised or taken over. Check out our How To Turn Off Automatic Updates for Kodi Addons and Repos guide to learn more and find out how to take care of this. The_Alpha, a very well known developer within the Kodi third-party community, received a hand-delivered DMCA notice at his UK home that started off with “This letter is addressed to you by companies of the six-major United States film studios represented by the Motion Picture Association (MPA), namely Columbia Pictures Industries, Inc., Disney Enterprises, Inc., Paramount Pictures Corporation, Twentieth Century Fox Film Corporation, Universal City Studios LLLP and Warner Bros. Entertainment Inc., Netflix, Inc. and Amazon Studios LLC (represented by MPA via the Alliance for Creativity and Entertainment (ACE)), Sky UK Limited, and The Football Association Premier League Limited.” ‘Nuff said, at least for The_Alpha. Many other add-ons and repositories have begun to shut down due to the scare tactics the MPA & ACE have employed. Having skirted the grey line for so long, many developers are now afraid that they may have been wrong. At least, they say they may have been, then apologetically bow out of the limelight. When the laws seem to decide what is right and wrong rather than the other way around, much bedlam may ensue and often does. Keep yourself and your family protected from the prying eyes of Big Brother with a secure VPN. Your location, identity, and online activities remain unlogged and untraceable (even to your own ISP!) when using IPVanish. 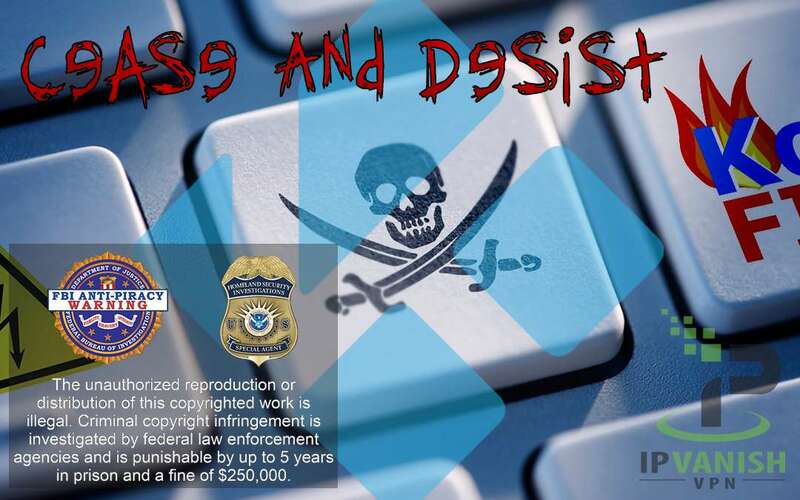 Amidst a recent frenzy of Digital Millennium Copyright Act notice hand-deliveries, several prominent Kodi third-party add-ons and repositories have shut down.